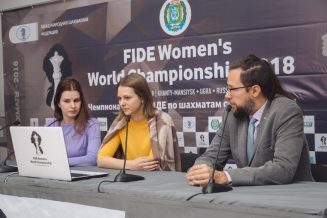 – Anna, you have already won four games in this event and in the second round you defeated Anastasia Bodnaruk from Russia. So please tell us about this match, how did it go? 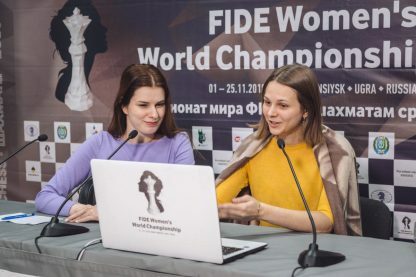 – Yes, I won all the games but in this tournament it doesn’t matter if we win 2-0 or 1.5-0.5: it’s more important to win the match. Therefore yesterday my win with the black pieces was very important. – Yesterday you had a very sharp game. Anastasia played an opening with an exchange sacrifice, did it surprise you? – It was a long and nervous game because we were in a time trouble. We have been playing 5-6 hours. I mean we almost finished last. I didn’t expect this exchange sacrifice from Anastasia but I think that a few moves after that it was only me who was playing for a win. So I am not sure whether it was so good for White. – And what about the second game, was it easier for you? – Well, there are no easy games here obviously, every game is difficult and very important. But, of cours,e when you play with White and when draw suits your situation, then it’s easier. 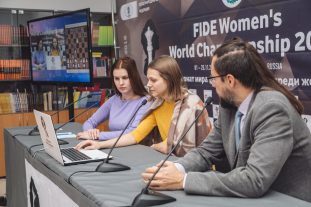 – It looks like a very nice strategic win form your side. Are you happy at this moment with your playing here? – The first games were quite okay but once again it doesn’t matter so much. The next match is soon. – After you finished this game were you watching your sister playing? – Yes, of course I was following her game. – What was happening there? 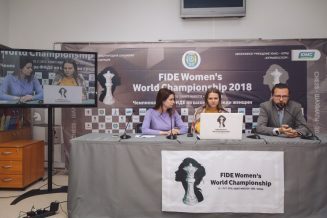 – It’s difficult to say because I thought it was lost but then when I saw her position right before coming here I thought she was winning so I am not sure. It was a crazy game . She allowed some attack but somehow she took the upper hand. I don’t know how. – Tomorrow will be a free day for you. What are you going to do? – Well, a free day only means that I am not playing but I will prepare for my next opponents. Not for the whole day, but quite some time. – And who is your next opponent? 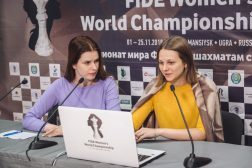 – Someone from the pair Stefanova – Saduakassova. I don’t know who as they are still playing. – Soon the match for the world crown starts in London. Are you going to watch it? Whom are you going to support? – Of course I will be following it because it is a match you can’t miss. Maybe if I play here longer, I won’t have time to analyze the games as deep as I could do it if I didn’t play in this tournament. It’s not like I will be really rooting for anyone but maybe it will be Magnus.